How often do you get the opportunity to advertise your business while simultaneously making an investment in your community? 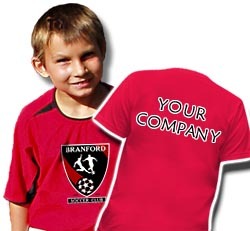 The Branford Soccer Club offers that opportunity by giving you the chance to become a team sponsor. With 30 teams and 300 players each Fall, and the same in Spring, the Branford Soccer Club is the town’s largest league sports program and its most diverse, with strong participation from boys and girls. Almost every weekend, those kids will square off to play, not Green vs. Red or Team 1 vs. Team 3, but “Branford Dental vs. P&M Deli,” “Cherry Hill Construction vs. Parthenon Diner.” In short, your identity becomes their identity, their victories become your victories. Each season, BSC has $275 sponsorship opportunities available for teams in L’il Kicks (coed, ages 4-5), Micros (coed, ages 6-7) and Juniors (Boys and Girls divisions, ages 8-9). Sponsors will be accepted on a first-come, first-served basis. Your company’s name printed on your team’s jerseys, which will not only be seen during games, but all year round -- on the Green, at the beach -- wherever players wear their shirts. Advertising on the Branford Soccer Club web site, where we will include a small advertisement, and even a link to your company web site, on our Sponsor Page. (Ad size 140x120). A team photograph and plaque engraved with your company’s name for display in your offices -- a great way to show your customers and clients that your company is involved in the health and vibrancy of the Branford community. Recognition in the newspaper and in the Branford Soccer Club’s club-wide email announcements and flyers. We hope you’ll take the rare opportunity to advertise your business while at the same time making an investment in your community by becoming a proud sponsor of the Branford Soccer Club. You can fill out a sponsor form and pay online by scrolling to near the bottom of the 'Register Online' page, and clicking the link to Spring 2014 Sponsorship. If you'd rather pay by check, you must still fill out the online registration form. Just send the check to the address given during registration.